I’m 7 years old. I live in NYC and I have a 5 year old brother, Ryan. I like art supplies, American Girl dolls, Shopkins and LEGO. I also enjoy ballet and the movies. I want to be an artist and the owner of a doggy daycare when I grow up. At age 3, I was diagnosed with ewings sarcoma. 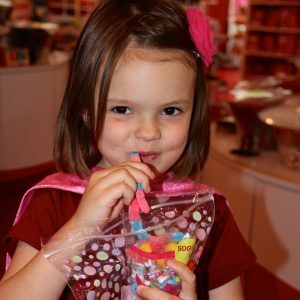 My favorite Candlelighters NYC experience is the Sugar Factory Halloween party – every year! My parents would say their favorite part of Candlelighters NYC is that Barbara is always there whenever we need her to inject fun and happiness into the worst times of our lives. Click here to donate to Candlelighters NYC in honor of Scarlett.